WELCOME TO THE ANNUAL ELM TEA FEST! Art on Elm is pleased to continue Elm Tea Fest. This brand new event last year will include tea vendors, tea tastings, guest speakers, and more. This one-of-a-kind festival will also offer the opportunity to attend a ticketed afternoon tea, including traditional delicious treats. What is a tea festival? Well, in short, it is a day all about tea. Learning about tea, tea preparation, tea culture and history and of course, tons of tea tastings! The main event, so to speak, is our tea market. All gathered together in one big auditorium will be lots of tea merchants. There will be local Waco area merchants as well as vendors from across Texas and across the country who will have tea samples for tasting. If you’re interested in becoming a tea vendor at Elm Tea Fest, click here. Elm Tea Fest isn’t just about buying and trying tea. This is also about expanding your knowledge of tea and tea culture. To further that mission, we’ve gathered together some tea industry experts to speak on several tea topics. You don’t have to be a devoted tea drinker either to have a good time with us. Even if you are just tea-curious, you are sure to find something that tickles your fancy during this fest! Amanda Vermillion, a.k.a. The Tea Mistress, has had a lifelong interest in teas and herbs. Amanda’s French mother introduced her to “tisanes” (herbal teas) as a child. In college, Amanda took an herbal medicine course and learned about the healing properties of herbs. 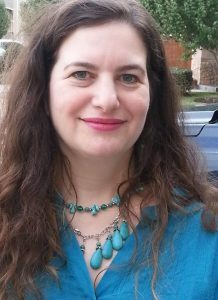 From 1996 to the present time, Amanda has led social groups and meetup groups in both New York and Texas and has organized hundreds (if not thousands) of events, meetings and social activities. She has served on the planning committee of four national conventions. The Tea Mistress, LLC combines Amanda’s passion for, and knowledge of, teas and tisanes. Amanda has been invited to do tea talks, presentations and tastings all over the Houston-Galveston metro area as well as Fort Worth and the Texas Hill Country. Amanda currently serves as Director of Lone Star Houston Tea Festival, Inc., a 501(c)3 non-profit organization. She has been the driving force behind the Lone Star Iced Tea Festival and the Houston Tea Festival. Amanda received the 2019 Outstanding Business Award from Texas Tea and Travel for success, dedication and support for regional non-profit efforts. Our teas,spices and herbs are carefully selected, and fresh. Our selection includes Whites, Greens, Blacks, and Herbal Teas to cover all your needs. If we don’t have it, we make it. Cadae Tea takes pride and honor in growing each of it’s herbs, fruits, and vegetables organically. Cadae Tea’s leaves are organically grown from a personal garden. The tea leaves are sun dried and blended for the customer’s health and for the best taste. Customer health is our priority and we strive, each day, to come up with diverse means to heal people naturally. Cadae Tea has been extended into to several farmer’s markets, a local health store (Drug Emporium), and “Farm to School”. ​Our goals are to test each of our teas with care, blend them with joy, and package them with love.